few ingredients and also good for your sweet tooth. as double ka meetha and also known as budin or pudin in many other countries. bread is soaked in the liquids, mixed with the other ingredients, and baked. in saucepan, add custard powder, sugar and butter and mix well to avoid lumps. bread slices into small cubes. Soak the bread in the milk. with butter and pour the batter in ramekins. raisins or almonds whatever you like. preheated oven at 180 degree cel for 25-30 minutes. lovely and tasty pudding with extra spoon of fruit compote. recipes, easy pudding recipes, something sweet recipes. Great idea of using custard powder to impart the thickness eggs give to a bread pudding. Nice eggless version! Nice eggless version of bread pudding. That is indeed a wonderful dish to bake..very nice one Preeti.. 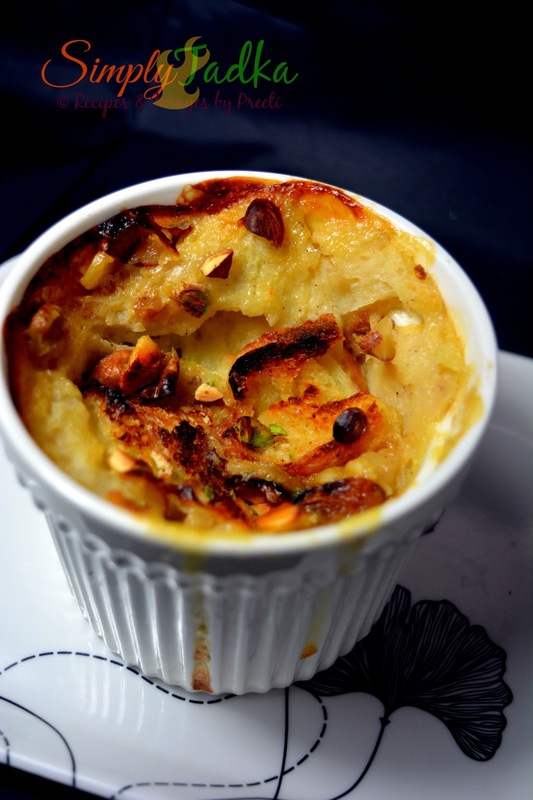 This eggless version of the bread pudding looks so gorgeous Preeti..
Wow ! That's a very delicious pudding , bookmarking ! Great idea of using custard powder, looks yummy. I always love this eggless bread pudding and i do this version quite often to please my tastebuds. I have to give your eggless bread pudding recipe a try some time Preeti. It looks amazing. Bread pudding is my absolute favorite and yours looks so inviting!